On a sunny Saturday morning in July when many people are just starting their day, there’s activity on the wooded lawn of Mt. 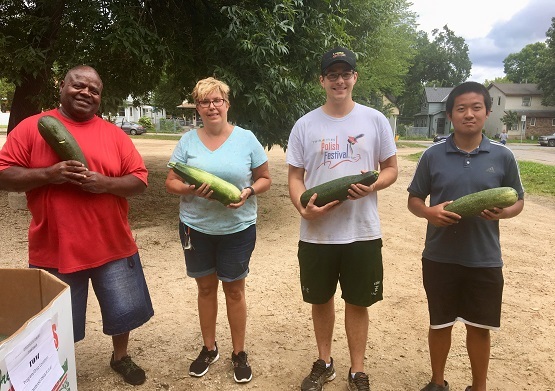 Olivet Baptist Church in St. Paul, Minn. Staff and volunteers bag fresh produce to hand out to the community — corn, apples, watermelon, sweet potatoes, zucchini. People swap recipes and the secrets for the perfectly grilled sweet corn. Neighbors and friends catch up on each other’s lives. Kids run and swing in the park next door before their parents call them back, bags of fruits and vegetables in hand. This lively exchange is part of Second Harvest Heartland’s Fresh Produce Distribution Partnership, now in its fifth year of operation. At countless locations in the metro area and beyond, community partners and volunteers come together to deliver an array of fresh and healthy produce, primarily from local farms, throughout the summer and into autumn. Setting up a fresh produce distribution transforms a usually quiet parking lot or side lawn into a whirring, festive market. Colorful produce line tables under the shade of tents. While visiting fresh produce distribution sites at Mt. Olivet Baptist Church and St. Olaf Lutheran Church in north Minneapolis, staff and volunteers made it clear that they were excited about the work they were doing. As the distribution at Mt. Olivet is underway, Loveth Anyanwu hands out vibrant green zucchini to an incoming group of visitors. An employee of United Health, she wears a company T-shirt with her name on it. United Health’s volunteer opportunities web page brought the Fresh Produce Distribution Partnership to her attention. A sense of community, both on a small and large scale, is a reoccurring theme at fresh produce distributions. Volunteers – individuals as well as family groups, businesses, and alumni associations – work alongside each other, sorting produce and sharing stories. Some volunteers are participating within their own neighborhood, to give back to a familiar place in a new and purposeful way. Others have chosen to volunteer in an area they may have never visited, finding neighborhood kinship extends beyond city or area code. Not only is September produce harvest season in the Midwest, but it’s also Hunger Action Month! Volunteer for the Double Down Challenge and every hour will be matched with a $5 donation from Bremer Bank, up to $40,000.